Agriculture may be one of the largest sectors in the global economy, but it is facing challenges. Climate change, population growth, and food insecurity are not just bad for business, they have a global impact. To compete in an increasingly competitive and volatile market, the farming industry needs to shake up the way it operates – and disruptive technologies hold the key. Over time, farming has changed to adapt to the growing global population. But with a predicted 9.8 billion people living on earth by 2050, current methods will struggle to produce enough yield to meet demands. Could using IT in agriculture be the answer? The industry is evolving in order to combat these future challenges, exploring how technologies such as IoT and automation can support farmers and ensure viable business. Here we explore some of the challenges and benefits of IT in farming. The sheer amount of produce needed to feed the world’s population is huge, and providing food security is an ever-growing concern. To ensure a successful harvest, farmers need to be able to establish the ideal conditions for crop health and be able to detect any potential threat of pests or disease before it spreads. Technologies have become available to accelerate soil testing before planting, but also monitor plant nutrition levels and even recognize plant diseases once the crop has grown. Autonomous vehicles and drones can be equipped with cameras and sensors to gather data which is then uploaded into agricultural software. This quickly produces an overview of a crop for the user, or farmer, to see existing health and identify potential problems. Environmental awareness has certainly increased in the last decade or more, and the agricultural industry has established regulations and incentives to encourage farmers to increase efforts. Now, GPS, autonomous vehicles, and software enable precision agriculture and agronomics which ensures less seed, fertilizer, and fuel are wasted. This lowers costs as well as saving time for the farmer. Although some technologies that are key to precision farming are not new, such as GPS and remote sensing technologies, they are being taken to a much more complex and intelligent level with the use of artificial intelligence (AI). Robotics is already making weed protection and detection much easier, such as with autonomous vehicles that are programmed to visually recognize certain plants and spray them individually with a fungicide or herbicide. The level of accuracy that AI and smart robotics offer to farming will limit chemicals used and help create a cleaner agricultural sector. A major concern for farmers is ensuring business viability and market competitiveness. Agriculture is on the brink of a digital evolution, with digitization entering many areas of operation. Robots and autonomous vehicles will reduce labor costs, while increasing efficiency. GPS and contour mapping carried out by drones quickly provides farmers with highly detailed information on water levels and soil fertility – with data even being transferred via a cloud. Software gives operators a clear overview of operations and data analytics to help improve decision-making for the following year. Farmers will need to embrace these technologies in order to strengthen business and prepare for the future. itelligence recognizes the great potential for IT in agriculture, and for this reason has built a relationship with FarmBot. The California-based company creates intelligent farming robots that are connected to a game-like interface for an easy user experience. 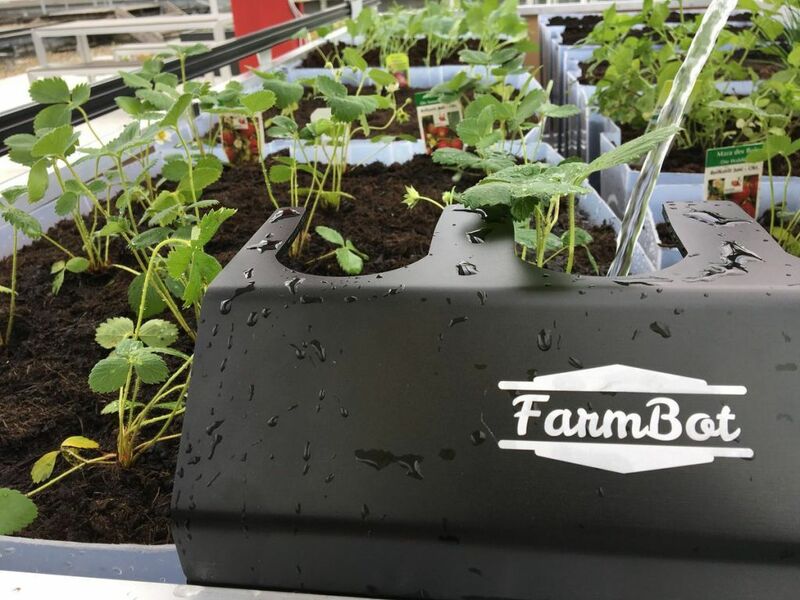 With interchangeable heads for sowing, watering, weeding, and other processes, FarmBot provides a sustainable and high-tech way to produce food for plots of various sizes; from greenhouses to smallholdings to commercial farms. itelligence is a convinced contributor to the idea of the open source FarmBot by farmbot.io. As a global system integrator for agricultural businesses with various robotics and sensor suppliers, itelligence has been working closely together with FarmBot in recent times. Jointly creating the FarmBot network, the two companies won the NTT Data Hackathon award together in 2017 and demonstrated how the robots can be connected using SAP Leonardo for further capabilities. Discover more on the FarmBot network in our next post in this series – The Future of Farming: Introducing FarmBot. You can also find the latest activities from FarmBot with the hashtag #farmbotnetwork on Twitter and LinkedIn. Join us on our roof terrace on August 30th, 2018 for a relaxed evening of discussions on farming of the future and FarmBot demonstrations. The event will take place at our office on Bismarckstraße, Berlin and you can reserve your place here on the meetup website.